Want to turn back the clock, look younger and healthier or be happier with your appearance! It’s possible, with a traditional face lift. A traditional face lift, or facelift, is an extremely safe cosmetic procedure that will erase wrinkles, tighten facial skin, and restore your youthful appearance. 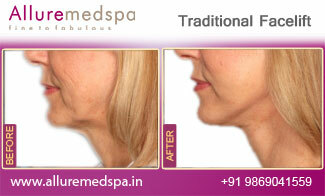 Choosing to have a traditional facelift, can empower you to look and feel 15 years younger. Enhance your beauty, and receive the benefit of. Happiness with your appearance again. 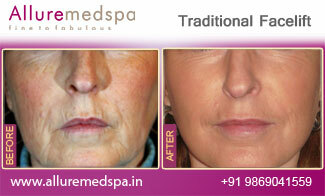 All this can be had with the relatively simple procedure of the traditional face lift. The traditional facelift is an appropriate procedure for patient’s seeking optimal correction of moderate to significant facial aging. 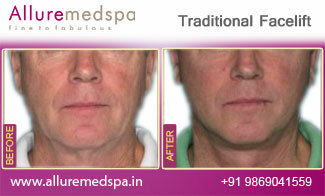 Incisions are positioned around the ears and into the hairline as well as a small incision below the chin. The skin is dissected from the underlying muscles allowing tightening of the muscles of the face as well as the neck. Bands of muscle in the front of the neck are sutured together and divided to help provide a smooth contour and defined neckline. Excess fat of the neck and jowls is removed as needed and the skin is re-draped in a natural fashion with excess skin removed both in front and behind the ears. This provides the surgeon optimal exposure and yields the most dramatic and long lasting results for the patient in most cases. Dr. Milan Doshi is a board certified cosmetic surgeon who is highly specialized in facial surgery procedures and the member of American Society of Plastic Surgeons (ASPS). He takes an extraordinarily detailed approach to each procedure, and believes there is no such thing as a standard facelift. Instead, he customizes every facial surgery to the needs of the patient. It is Dr. Doshi’s ultimate goal to maintain the patient’s natural beauty. Often facelift surgery procedures can be performed using local anesthesia. This gives patients the option of remaining relatively alert during their facelift, although general anesthesia is always an option. During more intensive procedures, general anesthesia may be required. In many cases, the length of a patient's facelift surgery determines whether local or general anesthesia will be used. Sutures are removed in 6-7 days and patients usually return to work within 10 days. Patients can resume light exercise 2 weeks after surgery. Allure MedSpa which is renowned for its state-of-the-art internationally acclaimed services, offers affordable and cost effective cosmetic procedures. To know more about the cost of your procedure request a consult by filling the form below. Your consultation is your chance to ask questions about Face Lifts and put your mind at rest. Your surgeon will be able to offer you full explanations and answers to all of your queries. The best facelift candidates have realistic expectations and are willing and able to follow the pre- and post-operative instructions provided by their plastic surgeons. Strong bone structure: Ideally, a facelift candidate will have a well-defined underlying bone structure to provide support and contribute to satisfying results. Realistic expectations: A candidate should understand not only what facelifts can accomplish, but also the limitations of facial plastic surgery procedures. Good overall health: A good facelift candidate will be generally healthy and will inform his or her surgeon of any preexisting medical conditions well in advance. Loose skin on the face or neck: Facelift candidates typically want to remove excess skin from the face or neck, tightening skin and reducing the appearance of wrinkles simultaneously. The surgeon trims the loose skin during the procedure. Over the first 2-3 days period, patients are advised to keep their head elevated and continuously apply cold compresses to the eyes and face. Minimal bruising and swelling may be present, and both are completely normal. These transient effects of surgery usually disappear very quickly. Numbness, tightness and discomfort may be experienced during the healing process, however the face heals quickly in general compared to other areas of the body. An idea of the results you can expect will be visible almost immediately after you have recovered from surgery, however you should wait for six months to appreciate the final results. Results are long lasting, however the ageing process cannot be prevented and such things as gravity, skin type, genetics and lifestyle mean that sagging may occur again in the future. At Allure MedSpa, our support doesn’t end when you achieve your cosmetic and health goals. Lifelong follow-up with our multidisciplinary team is encouraged, helping you to achieve and maintain optimal results.For more information on hair transplant surgery and our extensive aftercare program or to Book an appointment, call Allure MedSpa at: +91 9869041559. Will facelift surgery eliminate all of my facial wrinkles? Facelift can dramatically improve a patient’s facial appearance by removing excess tissue and tightening the muscles and tissues. How much pain can I expect after facelift? Some patients may experience mild discomfort in the neck and facial region, which usually clears up within a day. Many patients do not feel much pain following surgery; to keep patients comfortable, they are often prescribed oral medication to relieve any pain they may experience. What is the recovery like after facelift? 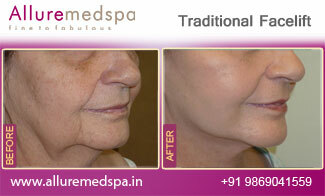 After facelift surgery, the patient will be sent home or to a recovery center with light facial dressings. It is recommended to keep head elevated for two to three days to minimize bruising and swelling. Patients typically look and feel confident after two weeks.